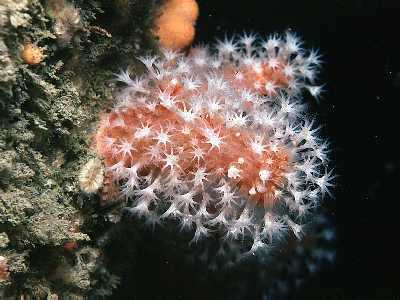 Description: Colonies of this soft coral branch into numerous slender 'fingers' which are less than 25mm in diameter (without polyps). 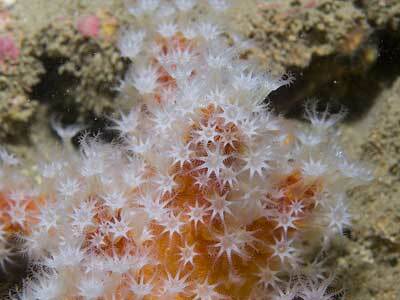 Usually red or deep orange in colour, rarely yellowish; polyps usually white. Height of expanded colony up to 200mm. Habitat: Typically on sheltered vertical rock faces in the circalittoral zone, or in crevices, beneath overhangs etc. Occurs in places with little water movement but usually on the open coast, such as on the lee side of islands or offshore rocks. May be in more open situations in deeper water. Depth range about 10-50m. Distribution: West coasts of the British Isles, north to western Scotland and south to Biscay. It is rather local in its occurrence but often abundant where present. Any records east of Torbay or north of the Irish Sea would be welcomed. Similar Species: This species is distinct from the Mediterranean Alcyonium palmatum, which lives on soft substrates, but may be identical to Alcyonium acaule - Mediterranean, hard substrates. Should not be confused with Alcyonium digitatum as fingers of latter, if present, are always stouter, less contractile, and usually paler in colour. Note also different habitat preferences. Long, slender fingers, usually red or watery pink in colour. 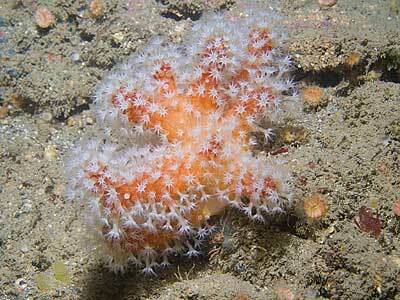 Polyps normally contrasting with body, usually white. Picton, B.E. & Morrow, C.C. (2016). Alcyonium glomeratum (Hassall, 1843). [In] Encyclopedia of Marine Life of Britain and Ireland.